It looks as if the rut is over for another year but the stags still seem to wander around the areas they have been living in for the last several months so we may still get some pictures or maybe even a crack at the big boy , who knows, but we will be out there looking. One thing is for sure if he turns up next year and is bigger than he is now we might end up living up there in the hope of getting a look at him. hillclima, Wildman, wsm junkie and 3 others like this. It's been a while since the camera's have picked up on our star attraction PD. 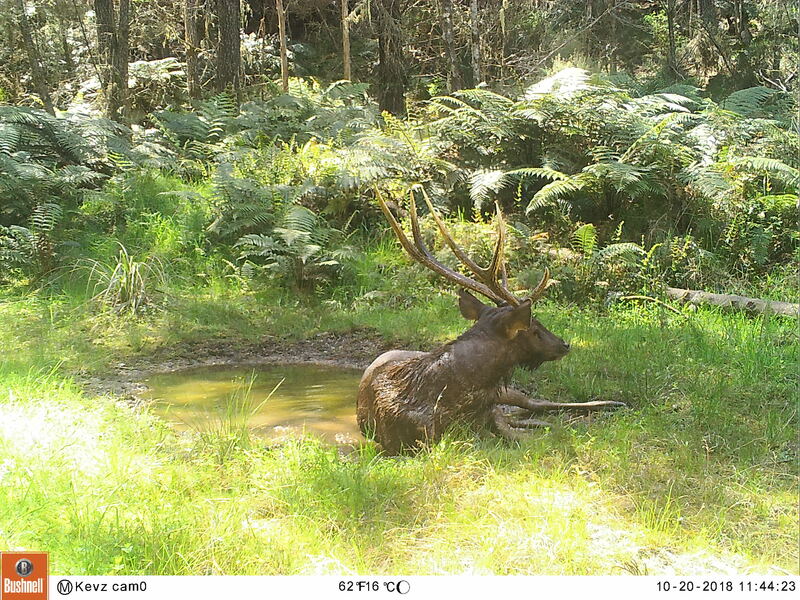 Beeman checked wallow cam yesterday and sure enough PD was there in all his glory around mid day on Saturday. Funny enough though we didn't check many camera's last weekend and had we done this camera we may have been lucky ….. you never know what's around the corner, it pays to check. 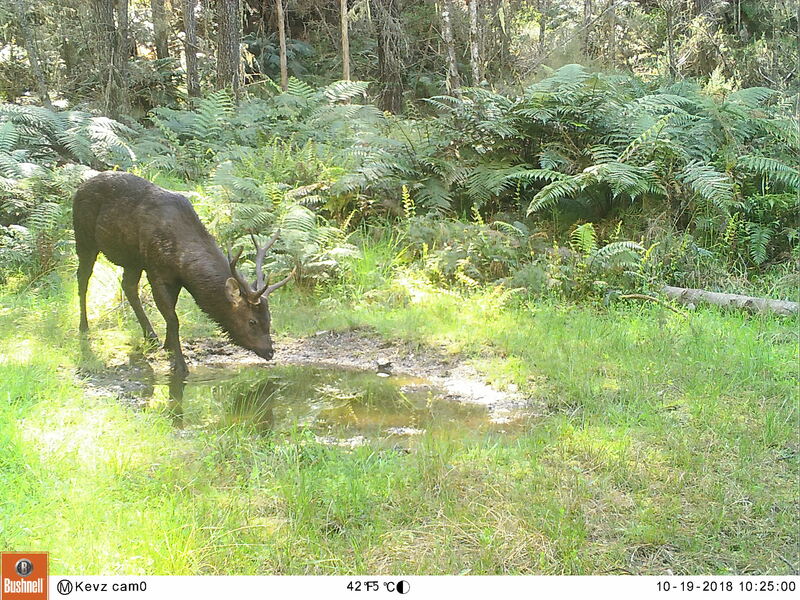 There was also another smaller newbie sambar stag and a very promising looking Red stag with nice looking velvet with a bit of growing still to do. 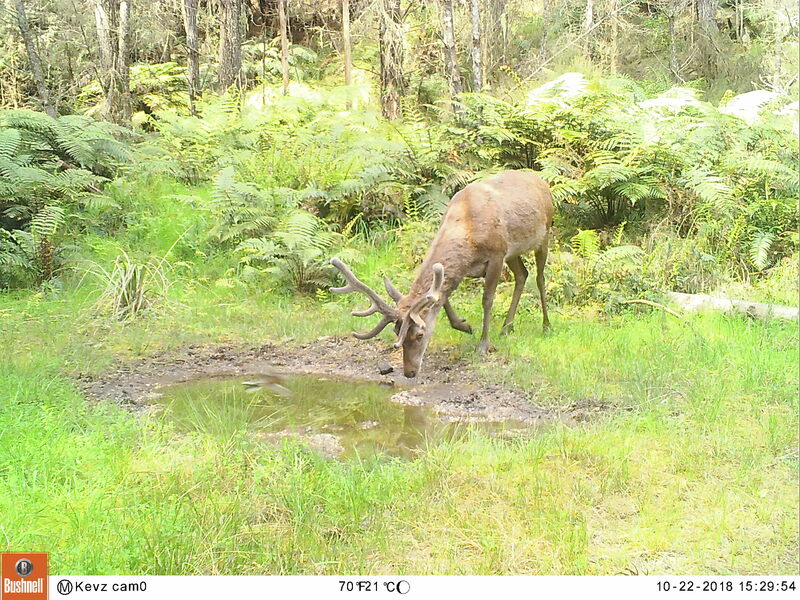 The first two pic's are PD then the smaller Sambar followed by the good Red. hillclima, Shootm, Rich007 and 10 others like this. That is a bloody big head on PD. 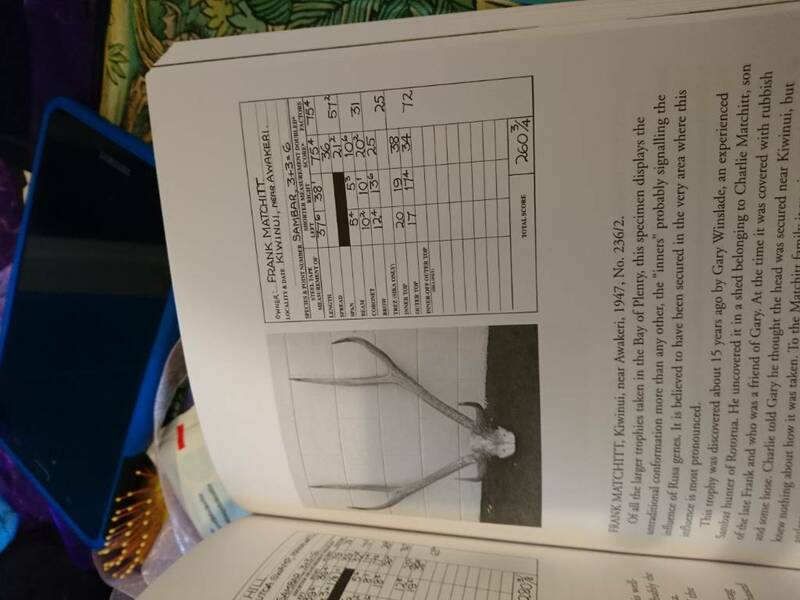 @Wildman you are correct ,we think he has to be up there in the DS the only place he may lack is in brow tine length the rest of his antler growth is great. 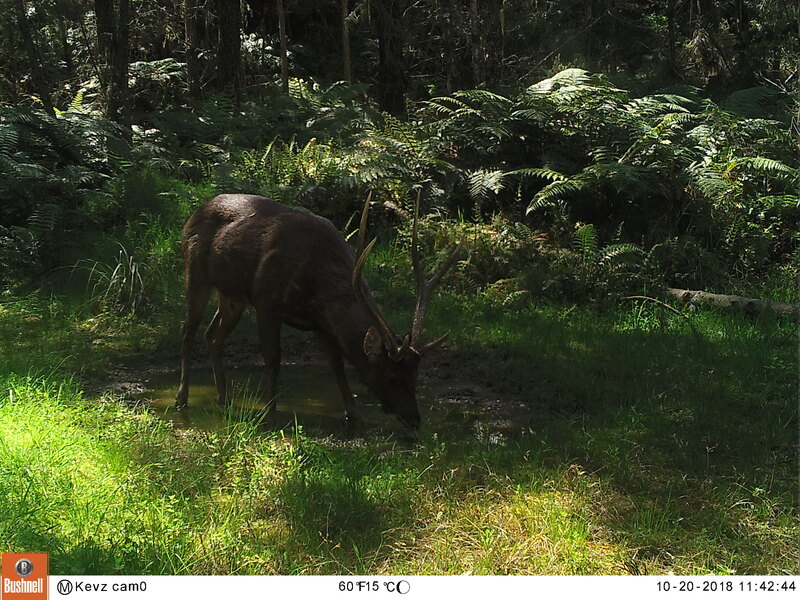 It is amazing how far these stags move about as Beemans cameras are spread over a fair area and PD seems to turn up on most from time to time, of late he has been on the two outer extremities and he could be traveling further out than those. It makes it hard to work out a pattern but it sure keeps things interesting. Ooohhh he is looking bloody good Brian!! Very cool. But his brows aren't short, just short compared to the rest! 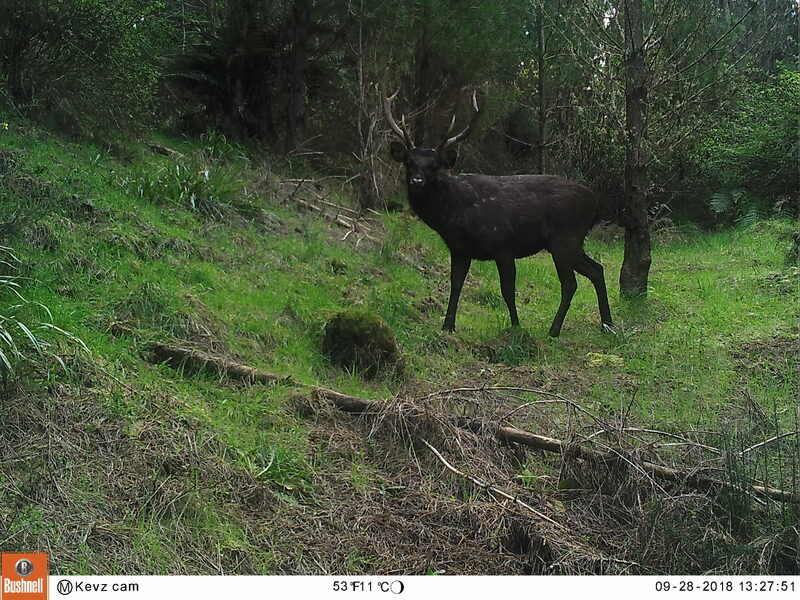 There are reports from round the Manawatu of stags moving up to 10 kms in the same season. ..
You are dead right on that one. @Wildman the brows do look short but most likely are better than they look due to the length of the main beams, would be good to even find one of his casts that would give us a pretty good idea on lenght and score. Have you tried measuring them against something in the background? Might give you a good idea. Even stand our put a pole of known length in the spot where he was lying would do the trick. Cheers for the posts I've never seen them in NZ only in Mauritius. The do driven hunting for them there. @Sideshow we have tried to guess the length by using the skull length method. The average skull length of a Sambar stag (adult) is about 17 inches, by using this which is a bit rough we think he could be in the 37-38 inch in length, may even more due to the curve in the main beam. hillclima and Wildman like this. Can only but keep trying. Something caught my eye the other day reading Bruce Banwell's sambar book. PD looks like he might have a bit of Rusa influence in there with those longer inner tops. Photo below is from his book and the second biggest trophy in there.